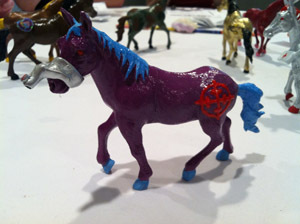 I didn’t know what to expect when I ran my adult-theme Laser Ponies convention game at OrcCon 2012. Convention games are an unpredictable beast. You never know who will show up at your table, or if they will buy the concept that you have spent endless hours prepping. This concept was especially risky with Laser Ponies, but I hoped that anyone who signed up for a twisted game of alien ponies would show up ready for anything. My table is all set up and ready for the players! I love having an amazing setup for my players when they arrive. I also like the players to be surprised by the characters that they get. Usually, my players have little clues when the arrive at the table, but nobody gets to see their character sheets until everyone is seated and we get started. For this game, each player had a bag waiting for them that contained their character sheet, a map, a set of My Little Pony stickers (just because they were fun! ), and a customized toy version of their character. Each bag had a picture that represented their character, but no other information. 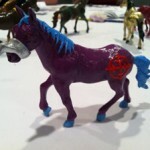 The customized ponies were the biggest part of my prep time for this game. Lots of people were very excited because of the crazy description and because we’d been talking about the game on the Happy Jack’s RPG podcast for months. EIGHT people were signed up, so I had to make a lot of ponies! They took about two weeks to complete, but I loved the challenge and the creativity involved. I sanded small toy horses that I bought at the Dollar Tree. Then painted each one with spray paint and puffy paint to make them look unique. I was thrilled that the players were so excited to get them. I was supposed to co-GM this game with my friend Casey, however he fell ill about 10 minutes into the game intro. Things went smoothly and the players bought into the crazy concept that we had created. Basically, the home of the Laser Ponies is being overrun by a drug cartel. The only ponies who can take a stand against this threat are the P-Team. Yes, we ripped off the A-Team, but damn did it make for a funny game. Each character had weaknesses, like uncontrollable lust, war flashbacks, drug addiction, fear of flying, and more. These weaknesses have to be rolled so the players never know when they will kick in. It made for a very adult, but very funny addition to the game.The players got so into it they started rolling their weaknesses, even when I hadn’t asked! The rainbow afro that the players created. They did this completely on their own! Lesson: Always provide crayons for your players! The game went incredibly well, and was one of the most fun games with which I have been involved. The players were what really made it magical. They were incredibly creative and energetic. The started making creative props of their own and kept acting out scenes using their toy horses. The insane plot ideas that they came up with were so unexpected, but it really made the game. Multiple times in our 4 hour game we had to stop because we were all laughing too hard to speak. I feel bad for the other Happy Jacks games that shared the room with us, but holy cow was it fun! The 4 hours flew by, and the game timed out perfectly, ending 10 minutes before the cut off time. The one thing that I wasn’t prepared for was combat. I had planned to co-GM, and Casey is a numbers guy. I had read the rules a few days before, but I couldn’t recall the exact damage rules once it was obvious that Casey wasn’t coming back. I was subtly trying to look up damage rules while I started the first scene. It didn’t impact the game for the players (as far as I could tell!) but it made those first few moments stressful for me. Lesson: Always have the book/PDF with you (huzzah! I did that!) and always read the combat rules before the players show up if its a new system to you. This was a REALLY amazing game. REALLY. I won’t be sharing any plot points here since I may have to run this game again. I might have to retire from adult Laser Ponies forever though, because I doubt any game could live up to the original P-Team.